Live-blogging is a great example of how journalists can use new technology to tell a story, be among the first to publish it, and provide a behind the scenes look at current events for news junkies. While bloggers have been live-blogging tech events like Steve Jobs product announcements for ages, the mainstream press is just starting to dip its toes in the water. 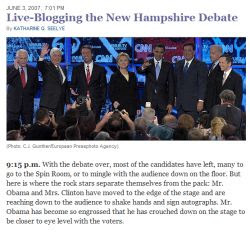 That’s why it was pretty cool to see that Katharine Q. Seelye of the New York Times live-blogged the Democratic presidential debate in New Hampshire this weekend. If all you wanted to do was watch the debate on TV, that was easy enough to do. But Seelye’s blog included some extra insights. If you watched the debate while reading the blog, it was sort of like hanging out with a veteran political reporter while watching the show. And most importantly even after the Times ran its article the next morning, readers interested in a blow-by-blow description can still go back and read the blog post.